In 1968 Finnish architect Matti SUURONEN designed and built his first "Futuro House". 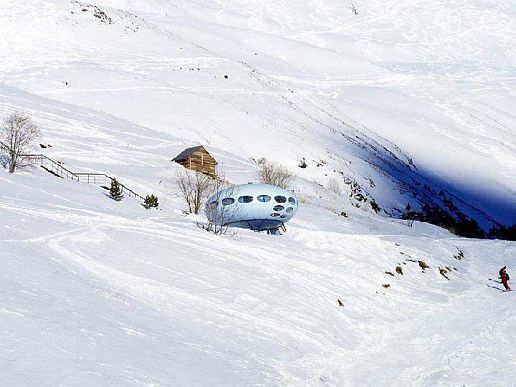 Initially conceived as a ski cabin, this flying saucer-like construction would later be manufactured world wide and serve other purposes as well (some owners used it as a holiday home, while others turned it into a small restaurant). The Futuro is made of fibreglass and is approximately 4 m high and 8 m across. A hatch door in its lower half opens down to reveal steps that lead into a room outfitted with six plastic bed-chair combinations and a central fireplace slab. There is also a kitchenette, a bathroom and one small bedroom. Between 1969 and 1973 manufacturing rights were sold to approximately 25 countries, but only about 10 countries launched production. There are probably close to 100 Futuro houses out there, some in very remote places, where they were brought by helicopter. The one in the picture is located in the ski resort of Dombai, Russia. It was carried to an altitude of 3,000 m (9,843 feet) and placed on one of the slopes of the Caucasus Mountains. More background info about the Futuro can be found at www.desura.fi, www.futuro-house.net, www.arcspace.com and www.kiasma.fi.